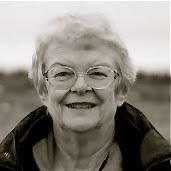 Many of you will recognize Mary's name from her Tuesday Tales - the series of blog articles she wrote in 2008 during her three-month genealogical trek across country. Mary has also made several shorter research trips so her expertise is measured in time and miles. Mary will tell us about taking research trips to our ancestors' locales, especially small and mid-sized places. She has made seven such trips from as short as one week to that once-in-a-lifetime journey. She will discuss preparation, tools to take, unique sources, tips/tricks and possible pitfalls.